One of the most important events on Switzerland's Christmas calendar is St Nicholas Day on December 6th. Samichlaus in the Swiss German part is known as San Nicolao in the Italian-speaking Ticino. In some homes he comes unseen during the night of December 5th and leaves his offerings in shoes that have been filled with hay for his donkey and put outside the door. 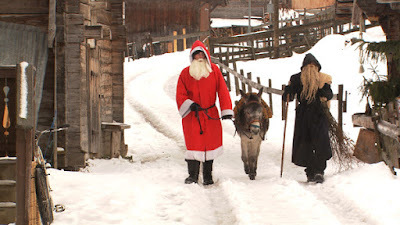 In most parts of Switzerland, however, "Samichlaus" usually comes in person on December 6th, wearing a hooded red robe, ringing a small bell and carrying a burlap sack of gifts. He tends to be on the thin rather than fat side, and lives in the forest as opposed to the North Pole. He quizzes children about their good and bad deeds of the past year. Once praise and blame have been distributed and the children have recited their obligatory verses, "Samichlaus" rewards them with "grittibänz" (bread men), chocolate, clementines and nuts. Often the sack-bearer is not "San Nicolao" himself but his companion, a dark clothed figure with a blackened face who may threaten to carry bad children off in the sack. He answers to many names, depending on where he appears: Schmutzli, Père Fouettard, or l'uomo nero. Over the years though, and despite retaining his foreboding appearance, Schmutzli has evolved into a more benign figure. So have you been good this year? Following is a lovely Samichlaus good night story written over 60 years ago.